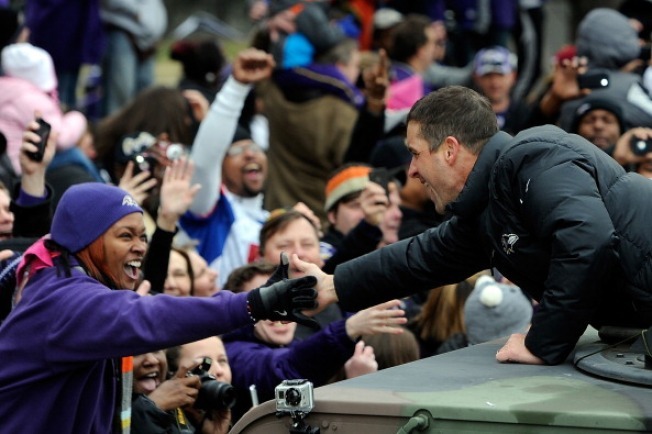 Head coach John Harbaugh of the Baltimore Ravens celebrates with fans during their Super Bowl XLVII victory parade, Feb. 5, 2013 in Baltimore. The mayor of San Francisco is heading to Baltimore for a day of community service in honor of the Ravens' victory over the 49ers in the Super Bowl. San Francisco Mayor Edwin Lee will be in Baltimore Friday to make good on his Super Bowl bet with Mayor Stephanie Rawlings-Blake. They'll start at Baltimore's 231-year-old Lexington Market, where Lee will learn how to make crab cakes and soft-shell crab sandwiches. Then the mayors will help revitalize a vacant lot, read to 3rd-grade children at a city public school and paint and repair a police station. They'll be joined by AmeriCorps volunteers. Lee says he believes the day of service "will strengthen the relationship" between the cities and promote volunteerism. The Ravens beat the 49ers 34-31 in February's Super Bowl.